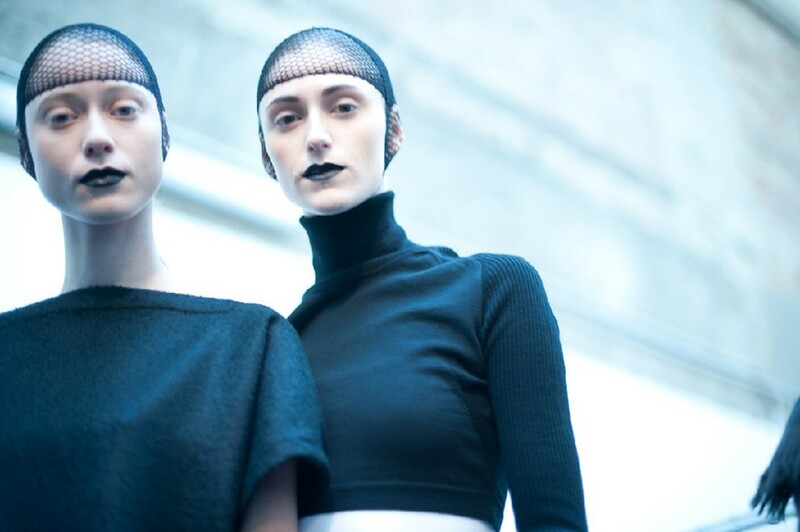 Initially it might have been difficult to see how Deborah Turbeville’s haunting images figured into Damir Doma’s A/W 11-12 collection, his third womenswear outing with the opening passage of stark, sportswear-inspired lines in monochrome. It then became clearer as the tunics in wool and leather feel in straight linear panels down the front or pleated tabards would fall creating clothes columns that referred to the statues in Turbeville’s pictures, and the girls here were elevated not on stone plinths but on raised platform shoes. It then broke loose into a section that included leopard ponyskin and Mongolian fur in the rusty Tibet-inspired tones that we saw last season except here there was an abundance of texture to add to this moment of being into the wild. Doma never let it slip too far from his controlled hands as he then steered the collection back into a portion of longline tuxedos that gave an elegant verve that will delight Doma’s existing cult-like fanbase as well as attracting new ones. Dazed Digital: Do you feel more confident with your womenswear? Damir Doma: I’m much more confident as I’m really happy with this collection and hope people can understand it. It was actually the collection I wanted to do with the first collection but it wasn’t possible at the time because I was coming from a menswear background, you have these references. After least season, I went in a more feminine direction and so this season I think I’ve got it right. DD: How did you distill Deborah Turbeville? Damir Doma: I love her photography. I’m always thinking of her girls, a special breed of girl - very fragile but at the same time very strong, romantic and attractive, especially with the facial structure. The look of the girl was in the collection. I always think about statues when I think of her photography. So I really tried to put the girls on these high platform shoes, like on stands or playing with these super narrow aprons to make them statue-like. DD: Where did the animal-based textures in the middle of the collection come from? Damir Doma: I really love to play with oppositions. A lot of references come from Asian culture – I love the atmosphere and the identity of the people and so I tried to add a new ingredient, something more tribal or African. But I still tried to present it in my way – clean and clear cut.